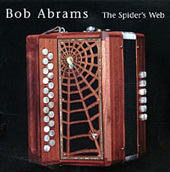 Bob Abrams is a C#/D accordion, melodeon and octave mandolin player based in New Hampshire. This is his second album--the first being "A Fool's Advice" and still available from Celtic Grooves--and is as good as the first. Abrams and his guests, Roger Burridge (fiddle), Brad Hurley (flute), Rick Gagne (banjo), and the great accompanists Peter Barnes (piano), Bob McQuillen (piano), and David Surette (guitar), deliver easy-paced and most satisfying performances in Irish traditional (rather than New-England) style. This sequel is a success.